Create multiple business email accounts with your own domain using this highly secure Business Email Hosting solution. Hosted in Singapore and easy to set up. Unlimited email aliases such as marketing@myCompany.com, support@myCompany.com to create a professional image for your business. Enjoy 25GB of email storage for less than $1 a day. 25GB (25,000MB) per each email account. Synchronise your mailbox with common mail clients (e.g. Live Mail, Outlook). 1-click setup for your mail clients. Simple dashboard gives you control over users and lets you view usage/storage details. Choose to use a single email address that forwards to multiple recipients. This enables a group of selected employees to receive the same email. Useful for a department to respond to emails faster, e.g. sales staff can receive all messages sent to sales@abc.com. If you have an existing domain, you can still enjoy the Business Email Hosting basic pack at less than $1 a day for up to 10 users. 24x7 access to your emails even while on the move. Data is hosted in Singapore with 99.5% SLA uptime. Built in engine that detects spam and virus. Configure your email clients automatically. All offers for this app include a 12-month contract. Select a plan to take a free trial or make a purchase. Can I use my own email domain name for free trial? No, you can't use you own email domain name for free trial. We will provide a temporary domain name for you (eg.&nbsp;beh-001.singteldns.com). Can I convert free trial to paid service? No, you cannot convert from free trial to paid service. To backup your mails, you need to download them into your mail client before the end of the 30-day trial. Can I buy add-on email accounts if I am using free trial? No, you cannot buy any add-on when you are using the free trial. Is there any limit to the number of emails I can send during the free trial? As part of our spam control measure, you can send up to 10 emails per domain per hour. You will receive a delivery failure notification when you send the 11<sup>th</sup> email. What do I get with the Business Email Hosting Basic Pack? You get your own hosted 10 email accounts with 25GB storage for each. Does it come with additional features such as Calendar, online storage and collaboration tools? Can I have additional email accounts if I need more than 10? Yes, you can purchase add-on email accounts, in blocks of 10, if you are not using a free trial. 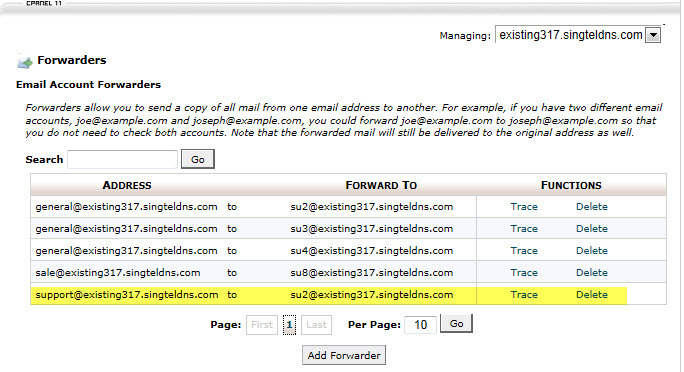 If you only need to receive incoming messages, you can considering creating email forwarders (aliases). What if I exceed my 1GB or 25GB storage limit? You will not be able to send and/or receive any emails. If I purchase additional email accounts, will I get more storage? Yes, each additional email accounts comes with 25GB (25,000 MB) storage. However, the storage is tied to individual mailboxes and non-transferable. Can I change the storage allocation for a particular email account after creation? No, you cannot change storage quota because it is pre-allocated for each account. Can I view the used storage under each email account? 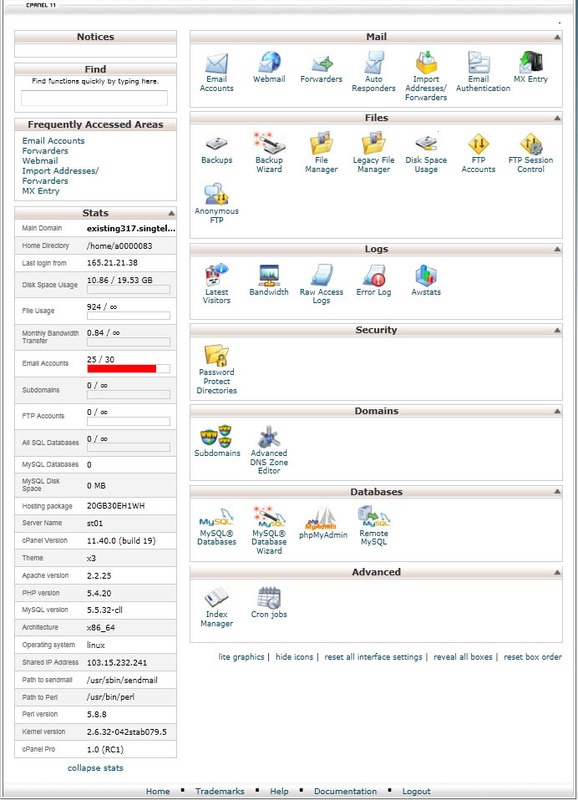 Yes, through the control panel, your administrator can tell the amount of storage used under each account. Yes, your email account can be accessible through any device, operating system, mail client and network that support connections through the standard POP3 or IMAP and SMTP. 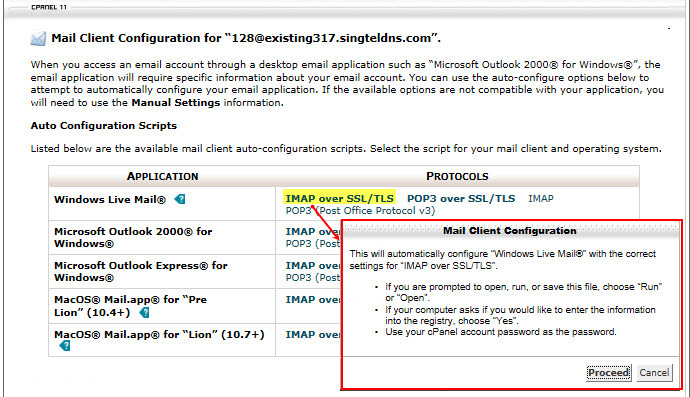 How do I configure my email accounts in Microsoft Outlook 2000? We provide auto-configuration scripts for the Microsoft Outlook 2000 mail client. You just need to click and install in your computer. There are auto-configuration scripts for Windows Live Mail , Microsoft Outlook Express, MacOS® Mail.app® for "Pre Lion" and MacOS® Mail.app® for "Lion" as well. You can also manually configure your account setting with our easy- to- follow instructions in the Control Panel. Can I check how many email accounts I have? Yes, the Control Panel will show the number of email accounts available under Business Email Hosting and the number of email accounts that you have created. My company sends many emails every day. Yes, we impose a limit on outgoing emails as our spam control measure. All email accounts under one email domain (i.e. all email accounts in your company) is subjected to a total of 200 outgoing emails per hour. If your email domain exceeds the limit, your emails will not be delivered and each sender will receive a failed delivery notification email from the system. During free trial, you can send up to 10 emails per domain per hour. You will receive a delivery failure notification when you send the 11th email. Are emails triggered by the Auto Responder by the Email Forwarder (Alias) functions also counted in the hourly sending limit? Yes, all emails sent from your mail domain are counted as outgoing emails. If I send 1 email to 3 recipients, will this be counted as 1 or 3 emails? It will be counted as 3 sent emails. I want to send promotional e-mailers to my customers, does this mean that I cannot use Business Email Hosting? You can do so as long as you do not exceed the outgoing email limit. However, as part of the our spam control measure, we do not recommend you to use Business Email Hosting to send promotional e-mailers. You can consider using SimplyCast eMarketing for your email marketing needs. If I purchase additional email accounts, will the outgoing email limit increase? E.g. if you have 3 quantities of email add-ons (30 email accounts), your outgoing email limit per hour will increase from 200 to 800 outgoing emails. What happens if my user exceeds his email storage quota? The user will receive a system notification when he reaches 80% of his quota. When he reaches his email storage quota, he will receive another notification and will not be able to send/ receive any emails. Can I access my mailbox from web browsers? Yes, we provide web access to your emails with RoundCube Webmail, a leading web-based mail client used by leading universities and commercial hosting companies. Can I buy the Domain Name Service only? Please refer to our Business Domain Name & Hosting service or SingNet .SG Domain Name Registration. Yes, the primary Domain Name Hosting is free when you buy it with Business Email Hosting. Can I transfer my existing domain name to be registered or hosted under Business Email Hosting? How long is the contract term for the Domain Name? The Domain Name is registered for a contract period of 12 months. The service fee will be billed annually at the start of each contract month period. You can terminate the service at any time with no additional penalty. The automatic renewal provides convenience and ensures business continuity to you, as it is common that Domain Name owners forget to renew it after 12 months. How long does it take to activate the email domain name? It may take 6 to 24 hours for the domain name to be activated. Once activated, you can start to send emails. Upon purchasing the Domain Name for Business Email Hosting, why am I not listed as the Domain Name Registrant? Singtel's partner is acting as the Registrant on your behalf in order to deliver a smoother, faster Domain Name provisioning process. No, you are still the Domain Name owner, even though you are not listed as the Registrant. Should you wish to update the Registrant information online, please click <a href="/contact-us">here</a> to contact us. Please note that continued usage and rights to the Domain Name is subjected to your compliance to the policies and regulations imposed by the respective Domain Name Registries. I purchase Business Email Hosting with existing domain name what do I need to do to use this service? You need to update the CName and MX records to activate the Business Email Hosting. I purchase Business Email Hosting + .sg Domain (or + Non.sg Domain) what do I need to do to use this service? No, you don't need to do anything. Once your domain name is activated within 6 to 24 hours, you can start to send/receive emails. Get the latest tips on using this app, read customers' success stories and more.